'ROOTS OF TM' enables readers to better understand how and why Maharishi Mahesh Yogi spread the teaching of Transcendental Meditation around the world. 'ROOTS OF TM' provides background information on Maharishi Mahesh Yogi and his master, Guru Dev, Swami Brahmanand Saraswati, and provides a source book of information about their teachings and techniques. 'ROOTS OF TM' is not intended as a general guide to Indian philosophy, or as a study of the many ancient spiritual practices of India, nor as a mantra handbook. 'ROOTS OF TM' offers information about Maharishi's 'missing years', from the time when his master passed away through to the gradual build up of his stated mission to spiritually regenerate the world; 'Why can't we spiritually regenerate the world through this technique?' he asked. 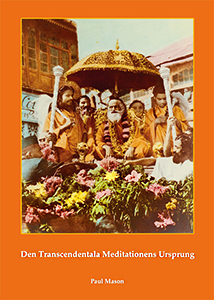 'ROOTS OF TM' contains numerous quotations and rare transcripts of lectures by Guru Dev and by Maharishi. Furthermore, it details the course of events that would eventually find Maharishi lecturing at the Masquers Club, an actor's social club in Hollywood. It also tells how Maharishi came to adopt a businesslike attitude to financial matters, and how he planned to create a headquarters in the Himalayas where he intended to train others to teach transcendental meditation. 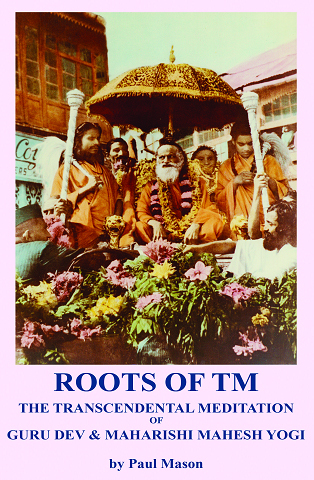 'ROOTS OF TM' digs deeply into rare materials in order to give detailed profiles of the teachings of both master and disciple, thus affording readers an opportunity to make informed comparisons of both these teachers' methods and their objectives. "By the mid-1960's the term 'Transcendental Meditation' became fixed after Maharishi Mahesh Yogi had already spread the message of meditation far and wide across the free world. Maharishi then became very famous himself, largely due to his public association with celebrities and in particular the world-famous pop group The Beatles who in 1968 attended an advanced training course with him in India. When I travelled to India in 1970 I did so by hitch hiking from Britain, and, having travelled across many countries, finally found myself in North India. Possibly because The Beatles had done so before me, I decided to visit the ashram of Maharishi Mahesh Yogi, for 'a cup of cocoa and a chat about philosophy', and therefore made my way to the pilgrimage town of Rishikesh, close by the foothills of the Himalayas. Having crossed the River Ganges and climbed up to Maharishi Ashram, I was introduced there to a practice referred to as 'transcendental' meditation. The teaching of this 'Transcendental Meditation' or 'TM' is preceded by a short ceremony called a puja, conducted before a portrait of an Indian teacher, an ascetic called Swami Brahmananda Saraswati, known to TM meditators as 'Guru Dev'. Surprisingly, despite the fact that Swami Brahmanand Saraswati was a prominent and influential public speaker, Maharishi's organisations share but scant information about Guru Dev's life story and disclose nothing about his teachings. Very little seemed to be known about the early life of Maharishi Mahesh Yogi or about the origins and history of the teaching of Transcendental Meditation, so I set myself to discover as much information as could be found. In the 1990's I was commissioned by Element Books to write the biography of Maharishi Mahesh Yogi, which was published as 'The Maharishi: The Biography of the Man Who Gave Transcendental Meditation to the World'. Later, in 2007 an ambition was fulfilled when a three-volume set of books on Guru Dev was published, all based on my translations of Hindi works on Swami Brahmanand. Then, in 2013, I compiled a book entitled 'Dandi Swami: Tales of meetings with Dandi Swami Narayananand Saraswati, the Guru's Will, Maharishi Mahesh Yogi & the Shankaracharyas of Jyotir Math'. 'Roots of TM' is really the distillation of decades of research into the teachings of Maharishi, Guru Dev, and the Shankaracharya tradition." Five Stars The Book Of a Lifetime! This tome by Paul Mason is truly a remarkable book of great depth and tremendous compassion. It is like taking a retreat in the 1960’s directly with Maharishi Mahesh Yogi as your guide. The book definitely shows the very roots of TM and the significance and power of the TM technique itself. Indeed in the very first few pages of the book you get a wonderful overview, in Maharishi’s own words, on the TM methodology itself. For someone like me who was initiated into my sitting mantra by my fantastic and late Aunt Initiator Effie Neville in 1976 it was like taking a shower in a cool stream. It reawakened in me the whole approach of effortlessness and naturalism that is at the very root of TM. Immediately upon absorbing the words that Paul relayed I found my meditation progressing at a much deeper level than before. These first few pages would be worth ten times the price of the book alone they were that valuable! As if this wasn’t enough the book touches on the greatness, majesty and compassion of the late Shankaracharya of Jyotirmath Swami Brahmanand (better known as “Guru Dev”). The book shows just what type of devoted devotee Maharishi was to Guru Dev and that his love of Guru Dev motivated his entire effort at spreading the “TM technique”. Mr. Mason shows that Maharishi’s whole being and life was devoted to distilling the truth as espoused by Guru Dev and not just his “own” cobbled together theories. In this way the author subtly address Maharishi’s various detractors with aplomb. Those who frequently claim that “Maharishi just made up the TM technique as some kind of pop meditation technique which is designed to lure the uniformed and to enrich his own personal fortune.“ That by showing the deep spiritual connection that Maharishi had with Guru Dev and that he could have hardly started such activities without other authorized devotees of Guru Dev knowing precisely what Maharishi was teaching. Through Mr. Mason’s exposition we gain an appreciation of the deep power of Guru Dev in a way that finds him very approachable but still awe inspiring. In this way Mr. Mason, without interjecting his own interpretations, skillfully distills from the very words of Guru Dev and Maharishi their deep and unbounded love for all of humanity. I was and am so moved by this book and cannot recommend it highly enough for any devotee of Maharishi, TM or even a practitioner of Buddhist Mindfulness, for there is something for all in this book that is sure to enrich your life and spiritual practice. teachings were presented and embraced in the early phase of Maharishi's mission.